Plaster model for Pioneer Woman and Ox. 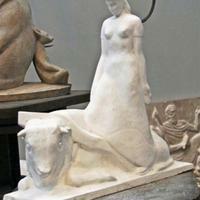 Clothed female figure standing beside a laying down ox. Her hands are at her side and her palms are open.